Dinabandhu Andrews College 2018: Candidates who want to know the details of Dinabandhu Andrews College Admission they will get it through this page. Dinabandhu Andrews College Kolkata, West Bengal offers admission to 1st Yr. undergraduate (B.A., B.Sc. and B.Com.) courses, 2018-19. Students with required eligibility norms can promptly apply for Dinabandhu Andrews College Admission by submitting their filled online DAC Admission form with required documents on or before the last date reach. Other relevant information regarding Dinabandhu Andrews College 2018-19 is provided below, those who want to attain more details must read this entire page thoroughly. For admission to the 1st Yr. undergraduate (B.A., B.Sc. and B.Com.) courses, 2018-19 students must have passed 10+2 examination or its equivalent examination in 2013 and onwards (i.e., in 2013, 2014, 2015, 2016, 2017 and 2018) are eligible to seek admission to 1st year B.A./B.Sc./B.Com [General (Pass)/ Honours (Advance) / Major] courses provided he/she has also passed in English having full marks not less than 100. N.B. If the subject ‘Environmental Science’ is studied as an elective subject of 100 marks, it can be taken into account for the purpose of determining the aggregate marks. Passed 10+2 level examination conducted by recognized Boards/Councils. Candidates from streams other than Commerce must pass in Mathematics at the 10+2 level. Candidates should have passed in the following subjects at the 10+2 level. Candidates, who are seeking admission in Dinabandhu Andrews College under UG course, need to pay Rs. 150/- per Application + Bank Charges @Rs. 10.00 (I.E. Rs. 160/-). To The Designated Branches Of Axis Bank. Following are Axis Bank Branches where fees can be deposited during banking hours. Selection and admission in Dinabandhu Andrews College will be based on Dinabandhu Andrews College Merit List. 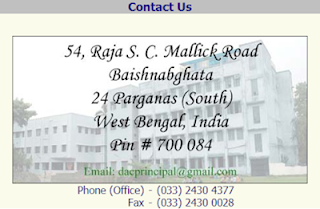 Step 1: Go to the official web portal of Dinabandhu Andrews College which is www.dacollege.org. Step 4: Now, students need to read Dinabandhu Andrews College Admission Notice completely. Step 5: For Dinabandhu Andrews College Online Admission, you have to select “Apply Online” link. Step 6: Fill Dinabandhu Andrews College Application Form with required information such as Personal information such as Name, Father’s Name, Address, Phone No, Category (GEN/SC/ST/OBC-A/OBC-B) etc. Step 7: Upload a recent passport size scanned image / Signature of the applicant at the available place. Step 8: At last, feed all the details for Dinabandhu Andrews College UG / PG Admission 2018 by pressing the “Submit” button. Step 9: Don’t forget to take printout of filled Dinabandhu Andrews College online application form for future usage. Candidates can open this Official Link to download further details about Dinabandhu Andrews College 2018. Post your comment here, if you’ve any doubt related to Dinabandhu Andrews College Admission 2018. Our team member will happy to help you and try to provide its better solution as soon as possible. Bookmark our web portal for receiving updated information such as Dinabandhu Andrews College Merit List 2018-19 and other details on your instant access.